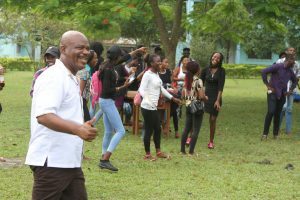 On 9th June 2018, the Jesuit Centre at Benin City hosted about 100 students of the Federation of Catholic Medical and Dental Students (FECAMDS). 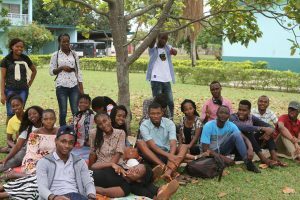 FECAMDS is one of the faculty units of the Nigeria Federation of Catholic Students (NFCS). It was a time for the students to welcome their new members and to do so in a prayerful ambience. It was also a time for the old students to interact and socialize with new students. Their host, Fr. Sam Okwudibe, SJ warmly welcomed the students to the premises and the students went on a tour of the novitiate. For many of the students, it was the first time they would hear the word ‘Jesuit’. They were fascinated by the beauty and quiet of the novitiate. They had a feel of the novitiate chapel, the gym, the classroom and the Cemetery. They observed a moment of silence while standing around the graves of our departed brothers. They also spent some time in the novitiate chapel where they admired the mural by the late Fr. Fernando Aritzi, SJ and asked a number of questions about religious life. At the end of the tour of the novitiate, many of the students including the female students wanted to know what they must do to enter the Jesuit novitiate. The female students were quickly alerted that across our fence, our beloved sisters; Medical Missionaries of Mary and the Sisters of the Sacred Heart will be happy to meet them. One of the young men asked if there were computers in the novitiate. And I responded, “Yes”. He said, can I come here to do computer programming? I said, “by all means, but first, come”.